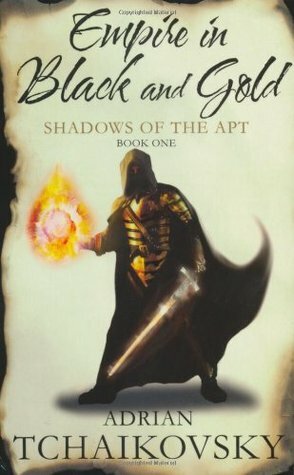 Enjoy smoothly told High Fantasy? Let’s see – there has to be a cast of well-fleshed characters fighting against an evil Empire and a satisfyingly complex villain, which you almost feel sorry for – until you discover exactly what he’s done… And the third person POV needs to move slickly between the characters with none of that jolting irritation because you’ve become too strongly attached to one of character’s storylines over the rest… Oh – and the battle scenes have to be packed with plenty of high octane action, clearly told and gripping because you really care what happens to the main protagonists. Have I left anything out? Hm… Well, there has to be some new fresh angle on this oft-trod path – otherwise you might as well reread one of your very well-thumbed favourite books. What if this tale is set in a world where various human tribes take on the aspects and appearance of various insect species? As with all above average Fantasy series, Tchaikovsky’s world is intriguingly complex. This is not a peaceful society. The highly organised, telepathic Ant-kinden spend their time fighting other Ant communities. Meanwhile, Beetles trade and mostly make the new artefacts which are spreading throughout the world. The Moths, Mantids and Spiders used to dominate the other kinden, but their inability to grasp the most basic piece of machinery means their numbers and importance are dwindling. However, they still have access to potent and highly secret magic. But Tchaikovsky manages to blend these insect characteristics with human traits convincingly, giving a fresh slant to the inhabitants of his classic tale. The steampunk technology also has some enjoyable ‘insect’ twists. Tchaikovsky also raises the question of where loyalty to a nation stops and personal morality starts as we follow the fortunes of Wasp Captain Thalric. And Maker Stenwold’s guilt at sending out young spies who often die is another side of the same issue – does Stenwold’s personal conviction that the Wasps are going to attack allow him to continue using young lives? While the rigid kinden rules often break down for half-breeds, who fail to be fully accepted within any of the insect tribes. All in all, this satisfying and substantial read is one that I thoroughly recommend – particularly as I found the sequel, Dragonfly Falling every bit as engrossing and well written and I look forward to getting hold of the third book, Blood of the Mantis, sometime soon.